I am not a fan of today’s customer service standards. There are some businesses that outshine others in that respect, though. I must give credit where credit is earned. We recently dealt with trying to get fast speed internet hooked up, and this process took three days. The first technician was not truthful. He said the box at the pole was dead. He assured us that a cherry-picker truck would show up the next day to make the box replacement. As he backed out of our drive, he hit that very same pole and damaged his company-owned work van. He went back to work and did not place the work order, so the box was not replaced the following day. He told his employer that his van was damaged by a hit-and-run driver (which we found out through sheer accident). This is an extreme example of bad customer service. The moral: lies never work. Lies are always uncovered. If you cannot do the job, or don’t want to do the job, you find someone else that can and will do the job. Period. Listen to your customers. Hear what they have to say. Do not assume you know what they are going to say. One small deed of good customer service goes a long way (to a better experience, and a better world in general). 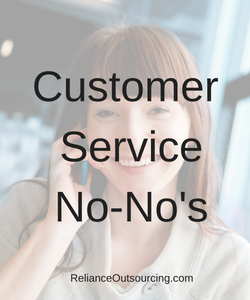 Your efforts in customer service are not just applied towards the dollars that you earn per hour, they apply to the world that you hold in the palm of your hand at that very moment. That, my dears, creates good customer service. How do you improve customer service/the lives of others? How do you pay it ahead (and isn’t that what it is all about)?